While the Canadian government does little, if anything, to address the public's appetite for online sports betting, its neighbour to the south has made efforts to curb what has grown into a multi-billion-dollar business. Editor's Note: This is the third in a three-part series of stories on sports betting in Canada. Here, we examine how other governments in North America are handling the industry in comparison to the hands-off approach in this country. While the Canadian government does little, if anything, to address online sports betting, its neighbour to the south has made efforts to curb what has grown into a multi-billion-dollar business. The United States tackled the issue a decade ago, during the online poker boom, after casino operators in Nevada — the only state where full sports betting is legal — realized how much revenue they were losing to offshore gambling websites. Under intense lobbying from the gaming industry, Congress acted quickly and in 2006 passed the Unlawful Internet Gambling Enforcement Act (UIGEA), which made it illegal to accept payments connected to betting over the internet in states where gambling is prohibited. "[Congress] said, hey, you offshore operators, your business is illegal, you are violating federal laws. But these operators put their thumbs and fingers on their nose and waved at the United States," says Dan Etna, co-chair of the Sports Law Group at Herrick Feinstein in New York City. That's why Congress made sure the law targeted businesses they could actually control — the banks and other companies who facilitate payments between online betting sites and their customers. "They would go after PayPal, or if you were making a payment through Chase Manhattan or TD Bank in the United States, whoever was providing a funds transfer from your account to this offshore website was violating federal law," Etna explains. "That's how Congress [policed] the offshore sites, by crimping something they had domestic control over." Etna acknowledges this hasn't eliminated Americans' ability to partake in online gambling, which the law does not say is a crime from the bettors' perspective (like in Canada, no American gambler has ever been prosecuted for placing an offshore bet). Many offshore sites stopped taking U.S. customers, but others carried on, and savvy gamblers can employ workarounds like proxy servers and certain third-party payment companies that allow bettors to top up their online accounts by acting as middle men between customers and their banks. In other words, there are ways around the law. In 2014, New Jersey passed a law that would allow sports betting within the state's borders — an effort to bolster the flagging casino and horse racing industries there. The move challenged a 1992 federal statute that prohibits state-sponsored sports betting except in Nevada, Oregon, Delaware and Montana, which were grandfathered in. So far, legal challenges have prevented the law from taking effect, and all four major North American pro sports leagues — as well as the NCAA, which governs collegiate sports in the U.S. — have opposed New Jersey's efforts. But a ruling from a federal court panel is expected soon, and if New Jersey wins the case it could conceivably begin offering sports betting immediately and other states could soon follow. The stakes are huge. Consider this: the Nevada Gaming Control Board says sports books in the state set new monthly records for handle (the amount of money they accept in wagers) in each of the first three months of 2016, including $459 million US in March alone. The books won $19.6 million in January, $28 million in February and $9.7 million in March. Etna says states like New Jersey want a piece of this pie, especially when many forms of gambling are already legal. "It doesn't make any sense to me as to why you can have a state lottery, why you can have state-licensed horse racing, but you can't bet on the Maple Leafs game against the Rangers," he says. The NBA may want in on the action too. While it continues to oppose New Jersey's efforts, it is alone among the big four leagues in publicly recognizing the billions American are gambling on sports and calling for changes. In an op-ed in the New York Times, commissioner Adam Silver called for a "different approach" to sports gambling. Silver pointed to the estimated $400 billion US being wagered illegally on sports in the United States ever year, saying "there is an obvious appetite for a safe and legal way to bet on sports." Silver called on Congress to "adopt a federal framework that allows states to authorize betting on professional sports, subject to strict regulatory requirements and technological safeguards." Such an appetite for change does not exist in Canada, where an estimated $4 billion per year is being bet through offshore sports books. In Ottawa, a private members bill sponsored by NDP MP Brain Masse that would allow betting on single games was recently introduced. Several provinces currently allow sports gambling through their lottery companies, but bettors are limited to parlays, where they must correctly predict the outcomes of multiple games. The provincial lotteries also offer poorer payouts on those parlays than bettors can get with offshore websites. "Just modernize it and move it towards a regulated market," Masse says. "So that this offshore betting activity is actually translated back to the taxpayer." The Liberal government, though, says it opposes the bill. "Nobody wants to be out front saying we need to expand gaming," says Toronto lawyer Michael Lipton. But there is a way forward, says Lipton, and it starts with offering a better product to bettors. "The way they have to do this is to say we need to protect the public, we need to gain more revenue, and the way to do that is to step in and regulate single-game sports bets. The [provincial] lottery corporations, as long as they have a monopoly, at least make them competitive because right now they can't compete against offshore sports books." Another option, Lipton says, is to end the provincial lottery monopoly and introduce a licensing system in which private betting companies can operate and be regulated by the government. A system like this currently exists in the U.K., where betting is widely accepted and readily available at brick-and-mortar private retail outlets. But in Canada, nothing seems to move quickly when it comes to gambling. While authorities and regulators continue, after two decades, to wrestle with how to handle the billions of dollars being bet through offshore sports books, other challenges have emerged. 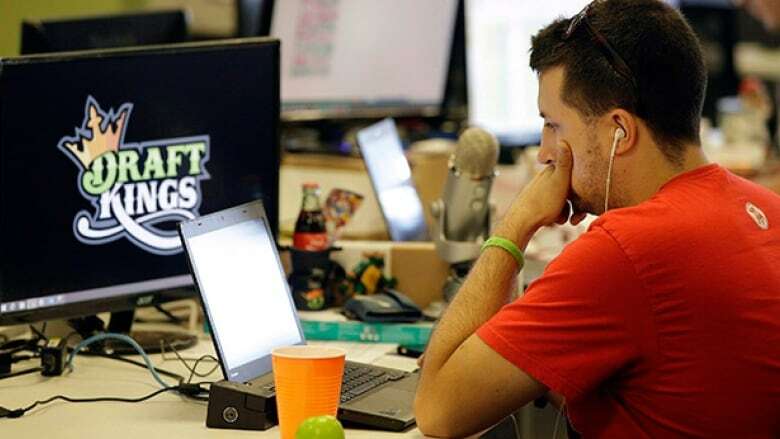 The rising popularity of so-called "daily fantasy sports" sites like DraftKings and FanDuel, where users wager and can win money based on their ability to predict the performances of individual players, has many asking whether this activity is a form of sports gambling. The growing industry has seized on a loophole in the UIGEA that deems fantasy sports a "game of skill," not of chance. When the act was passed in 2006, lawmakers wanted to allow fantasy sports games to continue to operate as most were relatively low-stakes, season-long games played among friends. They couldn't, or at least didn't, foresee the creation of the multi-billion-dollar daily fantasy business. In the U.S., some states have declared daily fantasy a form of gambling and deemed it illegal. Both DraftKings and FanDuel, the industry leaders, agreed to stop operating paid contests in New York under pressure from the state. Other states, like Virginia, have moved to regulate the activity and collect revenue. "Right now, daily fantasy sports is all over the place. It's like whack-a-mole where you think you've got one state figured out and then the next state does something contrary," says Etna. "So you end up with this patchwork quilt — it's legal, it's illegal, it's legal but only with certain conditions." But at least U.S. lawmakers are paying attention, trying to figure out an emerging trend. In Canada, much like with offshore sports gambling, there has been no move to do anything about daily fantasy sports, even as it explodes in popularity. For many pushing for change on the Canadian sports gambling landscape, it's another missed opportunity.